Part A can be labeled as a wish granted immediately while Part B was long over due. During my trip to Dubai this past January, my Uncle and his family took me, Jia and Uzair to City Centre Mirdif, a gigantic shopping mall in Dubai. We only went there for window shopping but eventually, I bought an item for Uzair he was asking me for a long time. Back in October last year, if I remember correctly, my mother bought two toy cars for her two grandsons. The one Abdullah, my nephew, received was a Mater toy truck, a character from Pixar’s Cars movie series. Uzair also received a nice toy car but that Mater truck attracted him more and he started to ask me about buying a one for him. I checked out several shops in Karachi but that particular toy seemed to vanish up from everywhere. Uzair didn’t forgot about that toy even when we landed in Dubai and as soon as he spotted a giant toy store in that City Centre, he took me in there. He didn’t paid any attention to the entire store as his eyes kept on searching for something else. Kids of my Uncle helped him out with full dedication as they were fully aware about what Uzair was looking for. And he found it up! That one toy truck Uzair was looking for, was in one of the shelf and the look on his face was priceless when he held it up in his hands. When I paid for that toy and we stepped out of the store, Uzair immediately grabbed up his dream toy and refused to hand it over back to me or Jia, despite our many requests. Uzair still plays with that toy truck of his along with other toys and he also remembers from where he bought it up from. And yes, about the Part A wish! 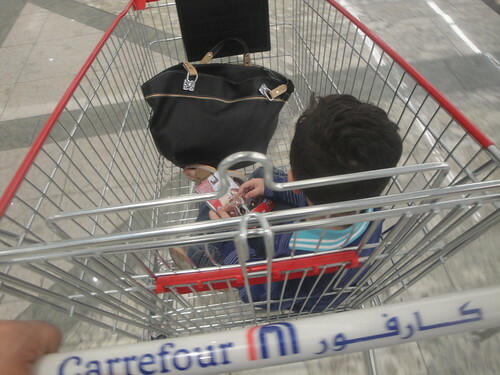 Uzair always wants to sit in the shopping cart, whenever we go to a grocery store. All kids are like that I suppose. Thank you Debbie for reading out my post. My son still remembers that day very clearly and that toy truck holds a special place among his entire collection.